William Kaplan's book "Why Dissent Matters" is an interesting pastiche of his opinions of a number of modern and current forms of dissent that are presented in a uniformly positive light, but are of greatly differing merit. The areas he examines are the failure of the Israeli military leadership to foresee the Yom Kippur attack by Egypt in 1973, through the failure to dissent from the agreed complacent wisdom of the general staff; the decision-making process in the U.S. National Security Council during the Cuba Missile Crisis in 1962, when everyone was encouraged to speak up, and a number of individual and demonstrative group dissenters, concluding with reflections on the Harper government in this country and the Israel-Palestine conflict. The fiasco of Israel's unprepared vulnerability to the 1973 attack by Egypt was redressed by Richard Nixon, when he sent Israel a new air force and heavy further reinforcements (in the midst of the greatest crisis of his career after he fired the attorney-general and the special prosecutor in the Watergate affair). There is no great argument about John F. Kennedy's crisis management over Cuba in 1962, except that he should not have removed NATO missiles from Turkey and Italy, contrary to the wishes of the governments of those countries, which made it a strategic win for the U.S.S.R., though it appeared to be a humiliating setback because Khrushchev was outmanoeuvred in the public relations arena by Kennedy. Kaplan goes farther in comments on the Vietnam War, implicitly claiming it was immoral. It was not; most South Vietnamese wanted to resist the Communists, but the high command made grave strategic errors. Kaplan dishonours dissent in accepting under that honourable umbrella those who agitated for the victory of North Vietnam, an act perilously close to treason, and in any case, shameful, as the subsequent massacres, flight of the boat people, and horrors of the Killing Fields demonstrated. Frances Oldham Kelsey, originally and ultimately a Canadian, was a magnificent and prescient opponent of thalidomide for use by pregnant women in the U.S. Federal Drug Administration, and was recognized with the Order of Canada at the age of 101, the day before she died. Rachel Carson, the great oceanic and agricultural ecologist, was another heroine, who weathered great obloquy, but was largely vindicated in her warnings about water pollution and the menace of insecticides. As she was a writer and self-employed researcher, she resorted to excess, dramatic license, and some outright muckraking, as the author admits, but she was admirable and largely correct, and an elegant writer to boot. Both these women make Kaplan's category of idealized dissenters. The section on dissent on juries and benches is unexceptionable, but can only be a slight glimpse of this vast subject. Most judges, in Canada and elsewhere, are a pretty job lot; many are slaves to media opinion, or their own prejudices, or to ludicrous minutiae of jurisprudence. And most jurors are people whose income rises with jury duty and who otherwise do little but watch soap operas all day. They can rarely be relied upon to grasp the proceedings, and the idealization of them is an indulgence of our everyman democratic preening self-image, but sometimes, individual judges and jurors do strike a blow for justice against the conventional wisdom. The chapter on the unjust conviction of Stephen Truscott for a murder he did not commit, in 1959, and his gradual acquittal from that charge, with the indispensable help of heroic journalist Isabel LeBourdais, is an inspiring and uplifting statement of what determined citizens can accomplish in a society where justice is possible to those who persevere. Here, Kaplan is taking up, and discharging with eloquence and conviction, the task of other writers and filmmakers who have espoused the rights and virtues of those who persevere against unjust but officially convenient verdicts: Truscott, without the wider political implications, was Canada's Dreyfus, and LeBourdais Canada's Emile Zola. These are noble roles, even reduced to historic scale, and Kaplan documents them with distinction. The narrative then becomes erratic. Occupy Wall Street, a movement of justly aggrieved but wildly irrelevant and unserious objectors to the crass absurdity of Clintonian economics: stupefying accretions of wealth for the traders and dealers who accelerate the velocity of the transactional economy and trickle down crumbs for everyone else while the welfare rolls are bulked up for reliable, dependent voters. They had no idea of how to combat these problems, saw only the symptoms and not the causes, and in their socioeconomically illiterate frustration, thought they could effectively occupy strategic and symbolic places in the New York financial district and elsewhere. I communicated publicly with some of the group leaders at the time. They were ingenuous and had legitimate complaints, and convinced Kaplan that they saw a chance of revolution, but they were innocents in Babylon, completely ineffectual complainants at the inexorable devolution of events. Kaplan should not have given them a chapter, and these dissenters did not matter a jot. Kaplan rebounded admirably with his severe but justified attack on the draconian dumb-on-crime, jail 'em all judicial severity, and hair-shirted know-nothingism of the Harper government. Its expansion of prisons, extensions of sentences, and discouragement of any assistance to reintegrate non-violent convicts was an abomination. It rolled back all federal government assistance to culture, environmental research and science. Apart from being retrograde in itself in terms of the national interest, it was unutterably stupid politically. A lesson that has been demonstrated many times, most convincingly by Franklin D. Roosevelt, and by Charles de Gaulle through his nomination of Andre Malraux as minister of culture, is that cultural and entertainment and scientific figures respond very positively and eagerly to patronage from a friendly regime. (Of course it helps if the cast of public policy and the personality of the leader induce spontaneous adherence.) These are groups that are unusually susceptible to the attention of the people in power, are very useful to the country, are voters who can easily be bought, and are very politically influential. Harper, with the same obtuseness that deprived him of any loyalty to (or from) anyone, any human regard for his cabinet or caucus, any light touch with parliament, did not heed this lesson. Whatever may be said of the Trudeaus, Brian Mulroney or Jean Chrétien, they remembered their friends, had a sense of humour, and in each case, have been a delight at dinner or in an informal conversation. Even Mackenzie King, prime minister for 22 years, though no barrel of conviviality, at least ladled out the official patronage, verbally and tangibly, to the cultural and academic elites. Up to this point, this is a pretty good book, but here William Kaplan grafts onto his narrative a wildly Israelophobic and unrigorously bowdlerized version of the Israel-Palestine conflict. The terrorists and Jew-hating leaders of the ostensible Palestinians are incongruously dusted off as dissenters in the same pristine virtuosity as the enemies of thalidomide and ecological pollution and unjust conviction of the innocent and hair-trigger war-making. It is a set-up; the narrative has built up a solid bank of appreciation of the positive role of those who dissent by nature (apart from the light-hearted apologia for the Occupy Wall Street foolishness). But suddenly the tenor and tempo change, and the horribly complicated problem of Jews and Arabs in Israel is rendered as apartheid, oppression, and the whitewashing of Palestinian terrorism and of their claim to a right to swamp the Jews demographically and reduce them, once again, to a minority, sure to be oppressed yet again, and this time in the country the world gave them as a Jewish homeland. It need hardly be emphasized that it is a complicated issue. The British sold the same real estate to both sides in 1917; the United Nations made Israel a Jewish state, and the Israelis have successfully defended and expanded it after Arab-initiated wars in 1948, 1967 and 1973. The answer is not to give knee-jerk adherence to a campaign of boycott and disinvestment against Israel in favour of an Arab population that will not leave because it is better treated and more prosperous than in Arab countries, and that shelters suicide bombers, knife-assailants of the innocent, and other terrorists. The Palestinians could have their state next week if they acknowledged Israel's right to exist as a Jewish state. The one good result of the escalated Islamist terror attacks against the West and the less fervent Islamists is that they have disabused almost everyone except Kaplan from extending any more moral or tangible support to the blood-stained charlatans of Palestinian terrorism. 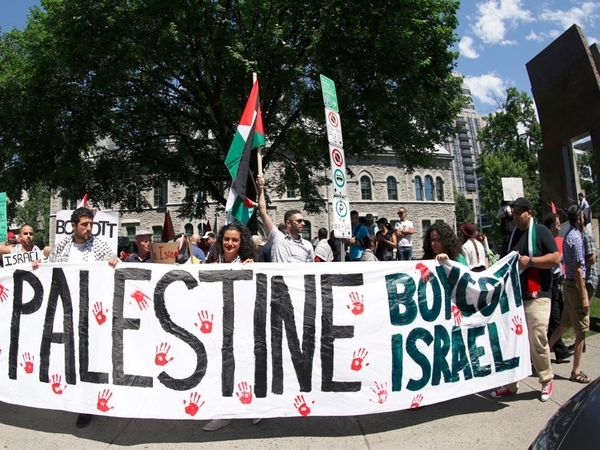 An economic boycott of Israel is an evil and stupid enterprise, and those otherwise respectable people who promote it, such as the United Church of Canada and Kaplan, should be ashamed of themselves, and eventually will be.